Posted by Iris Yan on 4/2/2019 2:09:00 PM. One reason that I love audiobooks is that I can listen to the audiobook while doing other things, such as doing laundry or taking exercise. So I prefer to playing audiobook on portable MP3 player rather than Iphone or Android device because the MP3 player is smaller and easy to carry. However, audiobooks purchased from Audible.com are protected by DRM and only can be played on limited apps and devices. Listening to Audiobooks becomes much harder because of the DRM protection. Many consumers want to play their purchased Audible audiobooks on any device or player. To solve this problem, I will introduce two ways to listen to Audible on MP3 player. Method 1 is importing Audible books to MP3 player with Audible Manager while method 2 is removing DRM from Audible and converting audible .aa or .aax to MP3 format with the best Audible DRM Removal. Although Audible claims that Audible is compatible with hundreds of devices from mp3 players to the latest and greatest phones and tablets, the fact is that you will only find few devices are compatible with Audible. Let's see what devices are compatible with Audible. The Audible app is available on iOS, Android, Kindle Fire, windows and Mac computers, but you can also listen to audiobooks on: Sandisk MP3 Players, Creative MP3 Players and Garmin & Tom Tom GPS Devices. You will find that the most popular MP3 players such as sonos, Sandisk, Zen Player, SonyWalkman are not on this list. So if your MP3 players do not support Audible files directly, just skip to method 2 to get your MP3 players worked. Anyway, if you happen to have these Audible compatible MP3 player, you come to the right place. To transfer Audible to MP3 player, you have to install Audible Manager to you computer. You can download it here. Unfortunately, you will only find Windows version of Audible Manager. Before the following step, you have to plug your MP3 player into your computer at first. Open Audible Manager, you will see Devices at the top toolbar. Click on Device-->> Add New Device, AduibleManager Mobile Device Update window will pop up. In this new window, you will see all AudibleReady devices. Select your device and click on "ok" button. 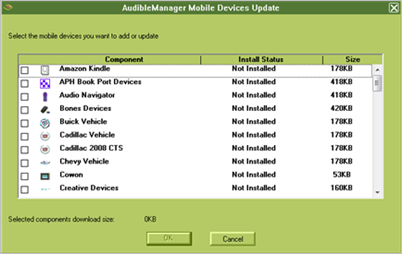 Now you will received a message asking that Audible Manager must be closed to install all the component files. Click on " OK" button to close the program. The Audible Manager will install a plug-in for the device you selected. When the component file has been installed successfully, the Audible Manager will close automatically. When you restart it again, you will see your device under the Mobile Devices section located in the bottom left corner. Find your Device under at the Mobile Devices section, right click it and select Activate. 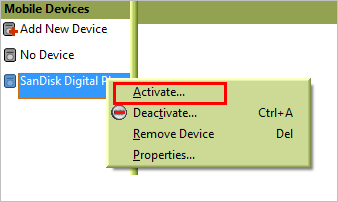 Then you have to enter your Audible account inforation to finish the activate process. When you have activated your MP3 player, you can transfer Audible audiobooks to your MP3 player. Ensure you have selected your MP3 player, and then the Audible book you want to play on MP3 player. Then click on "+Add to Device" in the upper right cornor. A progress bar will show you the transferring status. Once the process has been finished, your Audible audiobook will be transferred to your MP3 player successfully. Now you can play Audible on MP3 player. If we do not have Audible compatible MP3 device, can we listen to Audible on MP3 player? The answer is yes. Epubor Audible Converter enables you to convert the DRM-ed Audible books to DRM-free MP3 audio books so that you can play Audible on any MP3 player. Once the Epubor Audible Converter has been installed on your computer. You will see that the interface like the below picture. 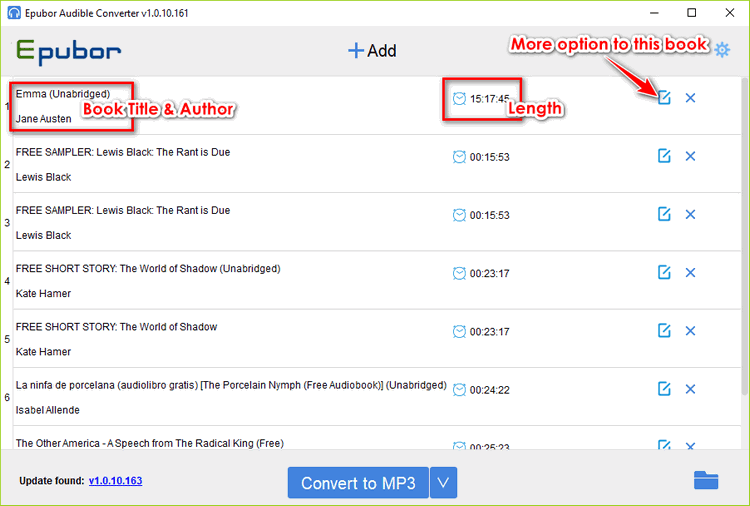 When you open the Epubor Audible Converter, just drag & drop the downloaded Audible books to the interface. Once the Audible files have been added to the Epubor Audible Converter, they will be decrypted automatically. The book title, author, book length will be displayed at the main interface. 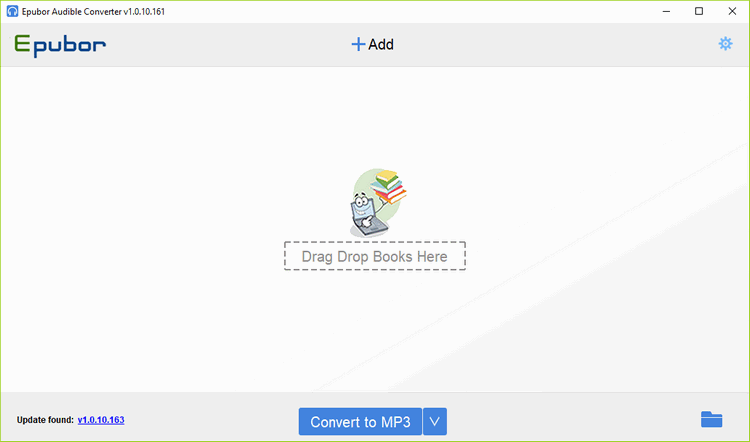 The click on " Convert to mp3"button at the bottom to start the process of removing DRM and converting audible file. Once it has been done, the there will be "Succeeded" at the end of each Audible audiobook title. Also, the folder with the converted MP3 file will automatically pop up. Now connect your MP3 player to your computer, and then copy and paste your converted DRM-free Audible audiobook to your MP3 player. From now on, you can listen to your own Audible books freely and easily. Some users have compained that the audible books are too long and seek the ways for splitting audible into chapter. 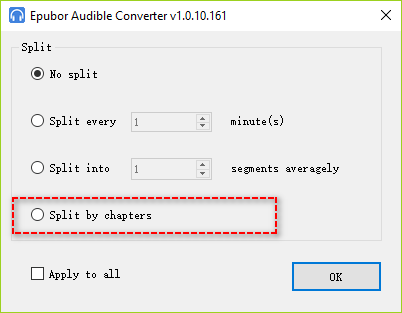 Epubor Audible converter can help you split audible into chapters easily. Below are detailed steps. 1. Add audible into Epubor Audible Converter. 2. Click the option button at the end of audible book title. There are splitting options as the following picture shown. 3. 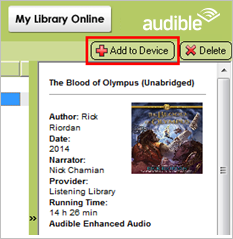 Select how to split your audible and then click on “OK" button. If you want to apply this option to all Audible books, just tick the box before "Apply to all" and then click on "OK"
4. 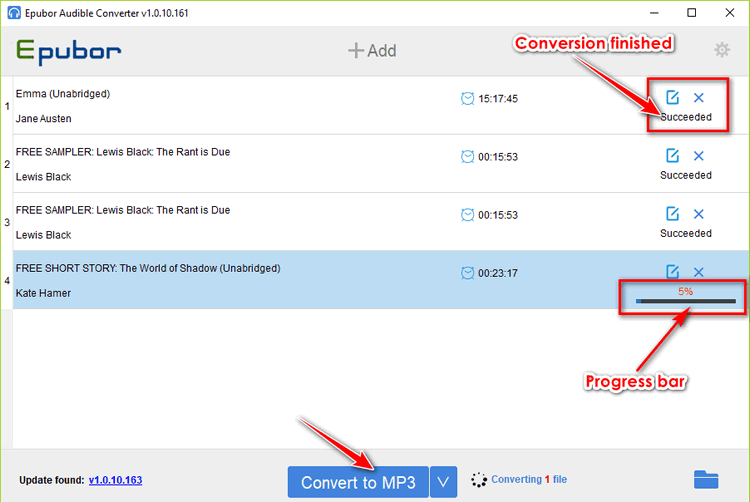 Then go back the main interface of Epubor Audible converter and then click on "Convert to mp3" button to finish the conversion. Meanwhile, your audible books will splitting into several MP3 files as your requested. Here are two solutions to play Audible book on MP3 player. If have the Audible compatible MP3 player, you can just use the Method 1. Or not, we recommend you use Audible DRM Removal tool--Epubor Audible Converter to convert Audible to DRM-free MP3 format and transfer the Audible to any MP3 player.